Did y'all make it to the Preservation Society of Charleston’s 2015 Carolopolis Awards ceremony on Wednesday at the Riviera Theater? We look forward to the party held every year at one of our favorite Art Deco spots in Charleston and this year's event did not disappoint! For those of you not in the know, here's a quick explanation of the Carolopolis Awards and some of this year's recipients. Interested in learning the history of why Charleston led the nation in the preservation efforts that resulted in this prestigious award? Read our Carolopolis Award newsletter from last year, How did we get here? 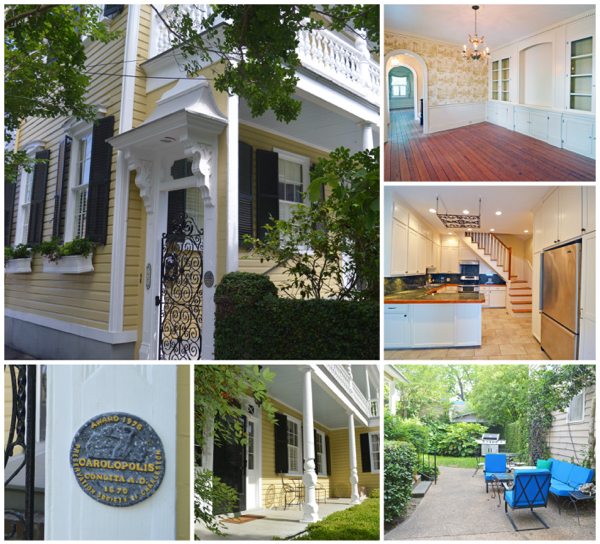 The Carolopolis Award is presented by the Preservation Society of Charleston to individuals, businesses or organizations who have achieved distinction in restoring or rehabilitating historic, architecturally significant properties in Charleston. Over 1,371 awards have been presented in recognition of such achievements since the program’s inception in 1953. The award is a plaque that is attached to the building and is intended to remain with the property. The Carolopolis Award is a slightly modified reproduction of the seal of the City of Charleston. According to their website, the word Carolopolis comes from the original name of the city, which was derived from a combination of the word Carolus (Latin for Charles) and Polis (Greek for City), thus Charles City and later Charleston. Condita A.D. 1670 refers to the Latin for founding, and the year of Charleston’s founding. The year on the top of the award indicates when the award was presented. This year The Preservation Society presented 11 Carolopolis Awards to buildings that have recently undergone significant restoration or rehabilitation, and three Pro Merito Awards, bringing the total to 20 since that award was established 15 years ago. The Cigar Factory. The circa 1881 former cotton mill is the site of the famous 1945 American Tobacco Company strike, where workers first transformed the gospel, “We Shall Overcome,” into a protest song. The recently renovated Cigar Factory once housed the culinary institute Johnson & Wales but its new inhabitants include Mercantile & Mash, Garden & Gun Magazine, and most recently, the Clemson Architecture Center. The Westendorff. 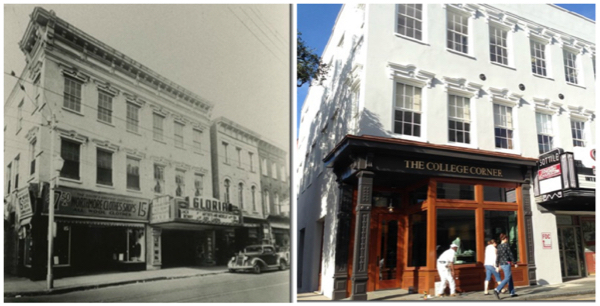 If you’re a foodie or had cause to pass regularly the corner of St. Philip and Warren Street, you likely followed the transformation of the former family hardware store and living quarters into what is rumored to be one of Charleston’s hottest new eateries. The 1905 CW Westendorff & Son building is admirably still in the family and has been serving the City its new fare since last July. The College Corner. Do y’all remember that funny little card and candy store on the corner of King and George? Barton’s? Well, the College of Charleston bought it a few years ago so that the school could enjoy a King Street presence--and what a presence it is (pictured above)! The German grocer John G. Myer constructed the building in 1855 and the facade was remodeled in the late 19th century; we now tend to see it as part of the former Gloria Theatre Building, built in 1922. Next time you walk by, check out the cast iron pilasters and wood shop windows--gorgeous! One of the great things that we’ve noticed in the last several years is the increasing number of homeowners outside of the Historic District who choose to undergo the rigor of proper architectural restoration and renovation--even though they are not within the purview of the Board of Architectural Review. We’ve seen them scattered throughout the Upper Peninsula, like the previously mentioned Charleston Cottage on President Street in the West Side. This year, we were very impressed with the work done on a couple of residences in Hampton Park Terrace. 2 North Allen Park was built in 1919-1920 for Manning J., Louis D., and Harry M. Rubin. The notable Louis D. Rubin, Jr. was born and raised here, going on to become “perhaps the person most responsible for the emergence of Southern literature as a field of scholarly inquiry” (NYT, 11/21/13). The home facing Allen Park had been neglected for a number of years before the current owners completed a full restoration. (Be sure to check it out next time you’re driving up Ashley Avenue to Hampton Park!) Down the street and around the corner, 14 Parkwood Avenue, pictured above, was constructed in 1917 for Gedney Howe, Sr. It was significantly modified in the 1950s and had been abandoned for several years before the current owners restored the Foursquare dwelling to resemble its original form. Doesn’t it look fantastic? Lois has two homes available for sale at the moment that have received the prestigious awards. The Charleston single in Harleston Village at 135 Queen Street (below, top) was constructed in 1890 and received a Carolopolis Award in 1975. The Francis Q. McHugh double tenement building (below, bottom) was constructed circa 1840 at 24 Wentworth Street. It was part of the Ansonborough Rehabilitation Project and was awarded the Carolopolis Award in 1967. Please give Lois a call at (843) 270-2797 to schedule a showing.